April 10, 2019 marks the International Day of Pink. It is a day where communities across the country, and across the world, can unite in celebrating diversity and raising awareness to stop homophobia, transphobia, transmisogyny and all forms of bullying. Each year on the second Wednesday of April, millions of people wear pink and take a stand. 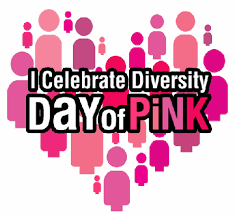 The Day of Pink is a symbol, a spark, that empowers and inspires youth across Canada to create amazing social change!